There are some excellent Civilian figures available in the Flintloque and Slaughterloo ranges which are very useful for adding something different to your sections or as the subject of a scenario. I've purchased several of these miniatures and I wanted to explain how I have used some of them in my games. 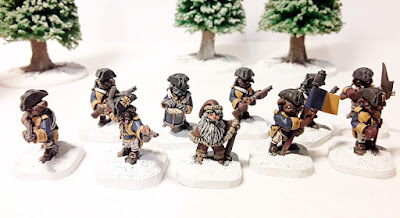 For this article I want to talk about the great Valon Civilians set which consists of a Dogman with a Blunderbuss, a Dwarf Lumberjack, an Orc in a coat and tricorne, an Orc with a flat cap and a knife, and last but by no means least a Gnome wearing glasses. These are all fantastic castings with great detail and character. The Alternative Armies Blog article in 2015 explains the background of each of these 5 characters so they are ready to use as suggested, but I wanted to use them all in the Witchlands within my narrative so they have different stories to tell. You may have met two of them in my earlier articles, so I'll mention these first. You would have originally met this guy if you read my 4th article in September 2017. When I was creating my Dogman section there are some great Witchlands figures available with the Dogman figures being some of my favourites, but I wanted a figure with a Blunderbuss as a bit of short range firepower as at that point my games tended to be smaller. This figure merges nicely with the other Witchlands Dogman figures and has been very useful in my games. In Flintloque a Dog Grenadier Blunderbuss fires at 80/8 within 10cm range and 35/6 between 10 and 30cm range so can do some damage when required. This guy appeared in my 5th article in November 2017 along with the 1st Pugglesberg Jagers. 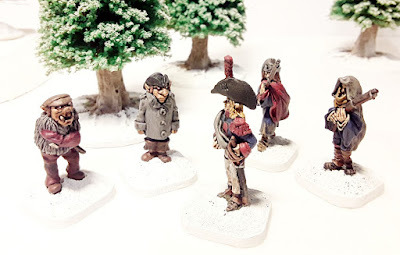 He has been used as Johan, a Dwarf Woodsman who had been acting as a guide for the Ferach forces but who had been knocked unconscious in a skirmish and left for dead. The Pugglesberg Jagers found him so brought him into their camp and gladly shared their dwindling rations with him. In return he has shared his considerable survival skills with them and shown them how to set ambushes for the dead. This has been a fun figure to use and with the Pugglesberg Jagers Johan is classed as a Dwarf Veteran / Light trooper armed with an axe. Due to his skills as a Woodsman if he is outdoors and uses a slow march or a half step march he cannot be seen by an enemy over 30cm away. At +5 in melee he has been useful in taking down the undead at close quarters! The two Orcs have been used together as 'Stab' and 'Grab', Orc Veterans from the Britorcn Army of Catalucia. In the army their exploits were legendary amongst the rank and file but frowned upon generally by their officers. Comrades in their section never went hungry as their reputation for scavenging and thievery meant that they would always 'acquire' whatever they wanted. Unfortunately they pushed their luck by plundering the baggage of their own general and the rumour is that they were only saved from being hanged by their Major who intervened on their behalf. He saved their lives but they were still dishonourably discharged. In the Witchlands their real names aren't known and they just use their nicknames. 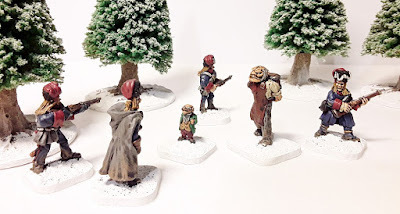 They have joined the followers of the Ferach army and can be hired as additional guards, thugs or labourers by whoever pays them, and they don't mind if their tasks require a moral flexibility which has seen them regularly called upon during the Ferach retreat especially as units compete with their own side for resources. It might be dishonourable for elves to steal from other elves but if the Orcs do it, that's a different story! 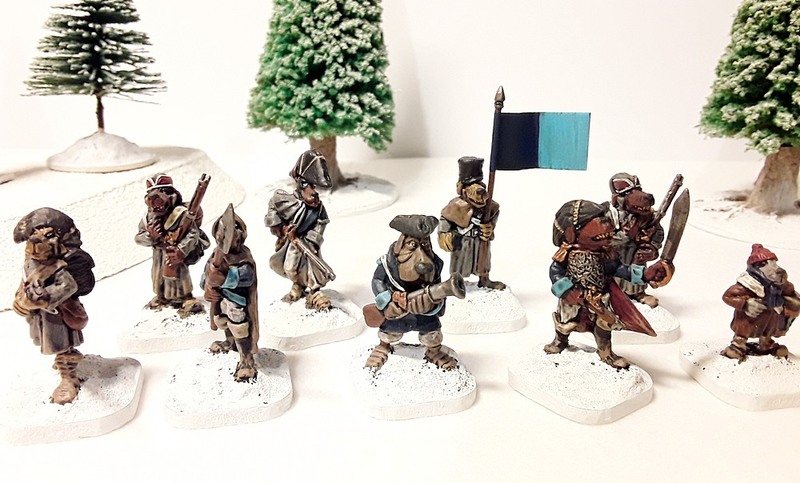 They are general rogues but appearances can be deceptive, in reality they are still members of the Britorcn Army and part of a group sent to the Witchlands to spy on and disrupt the Ferach forces. This group led by the legendary Spy Master Gorgon Lighfoote will feature in a future article. In my present games they are used as Experienced Orc regulars and can join any Ferach Elf section having been paid by the officer to assist his unit. They each carry 2 pistols and have knives hidden all over their bodies. In close combat they both fight with 2 knives but such is their skill they get a +2 melee modifier as if they were using a sword. As a bit of fun (and due to their hidden agenda) the Ferach player has to role 2 dice at the start of each turn, and if any double is rolled then Stab and Grab are controlled by the Witchlands player that turn. 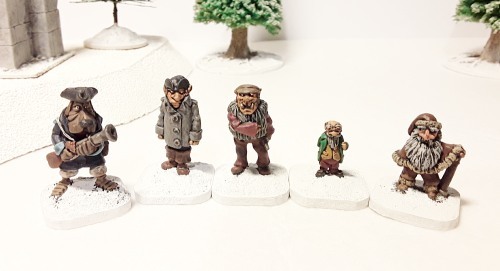 The diminutive figure of the Gnome known as the 'Quartermaster' is regularly seen behind the Ferach lines. Even during the retreat he can still acquire additional rations, powder, weapons, whatever is required for the right price. On payment of the agreed fee, he and his team of Ogres appear with whatever is needed. No-one knows how the Quartermaster came by his initial fortune or where he originally comes from but he is easily recognised by his brightly coloured outfits. 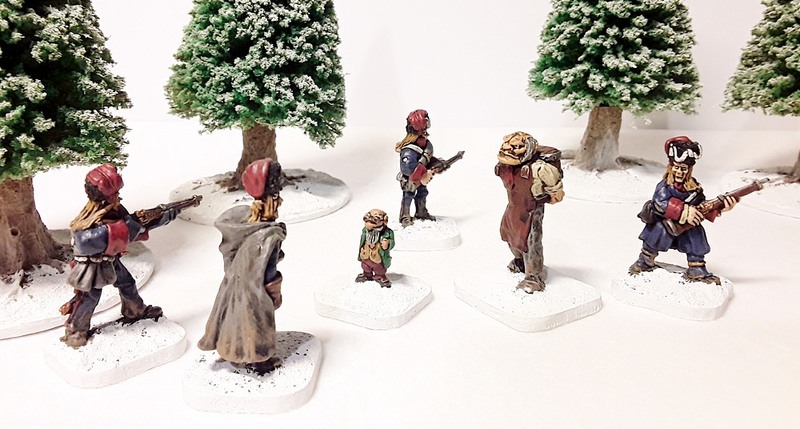 In my games he is used more as an objective than a character in a section, with troops tasked with escorting him across the board. If he is contacted base to base by a member of an enemy section, he has the resources and influence to escape but in anger will have nothing to do with the section that was escorting him and the scenario is lost.